While signing over my paycheck at Whole Foods in exchange for lunch, I caught sight of this bar at the checkout counter. I am usually immune to the siren call of such things, but dark chocolate is the exception. And hey, how can I resist helping cocoa farmers four times more? The founders of Madecasse were Peace Corps volunteers in Madagascar, who “fell in love with the country and people and wanted to do more,” and settled on making chocolate, with an extra twist. 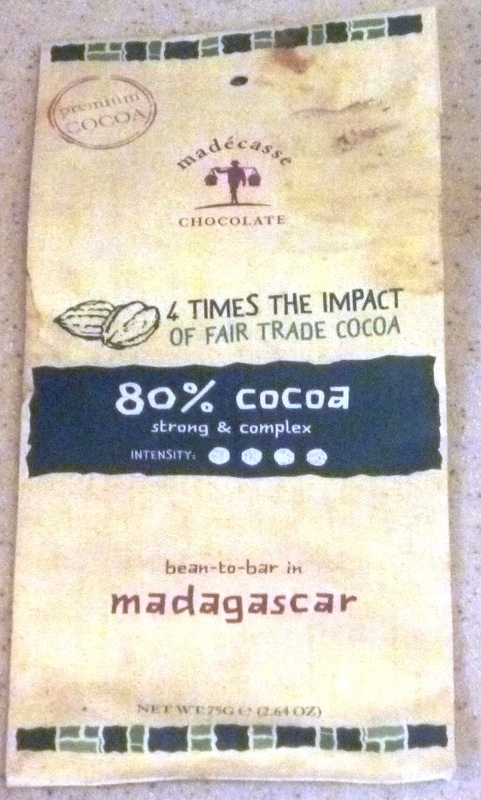 Africa grows the majority of the world’s cocoa, but very little (the site says less than one percent) is made into chocolate there, so they decided to go “bean-to-bar in Madagascar,” as the wrapper says. The simple, rustic-looking wrapper with appealing green-on-cream easily caught my eye. An interesting feature of this wrapper is that it opens like an envelope, so you don’t need to tear it apart. The gold foil inside wrapper added a touch of elegance. The chocolate has a subdued sheen, and a cocoa pod is stamped into each of the individual sections. A slow but even melt in the mouth that releases the intense flavor gradually (a good thing). Very smooth mouthfeel. The wrapper claims “strong and complex” and the chocolate lives up to it. With an 80% cocoa content I expected, and got, an intense cocoa flavor. Sucking on a section allowed me to taste all the various flavors, while chewing one brought out the mild sweetness primarily. I am not sure which I prefer. I got a hint of vanilla as promised, but could not pick up any “peppercorny” flavors. I also got an intense fruitiness which ended in an almost sour aftertaste. I believe many people will enjoy this (and Rachel did), but I personally do not. This is a very smooth and intensely flavored chocolate, as promised. If you prefer a “brighter” flavor profile, by all means give this bar a try. I give it three stars only due to personal taste preference, not to any flaws in the chocolate. The maker’s approach to helping African farmers is laudable, and if that means a lot to you, that’s another reason to try this brand. The more support we can give to fair trade practices, the better, as far as I’m concerned. Did you like this review? How can it be made better? Would you like to see more? Let me know. This entry was posted in Cooking, The Amateur Chocoholic and tagged 50, 80%, chocolate, chocolate bar, dark chocolate, fair trade, fitness, Madagascar, Madecasse, review. Bookmark the permalink. I will look for that chocolate the next time I’m in Whole Foods. (excellent after long run treat!) My daughter is always asking me to buy her a chocolate bar at Whole Foods that supports the rain forest; I believe it’s very close in price to this one. Did you notice if they have a milk chocolate bar? I’m a milk chocolate person; I’m not crazy about dark chocolate. I didn’t see a milk chocolate version at Whole Foods, but I was just looking at the register offerings. Madecasse offers a 44% (“dark milk”) variety on their website. If you want to help out a good cause, you can also try Theo Chocolate (see my review at the link below) or the Endangered Species Chocolate, both of which I’ve seen at Whole Foods and/or Plum Market. Both offer milk chocolate bars. 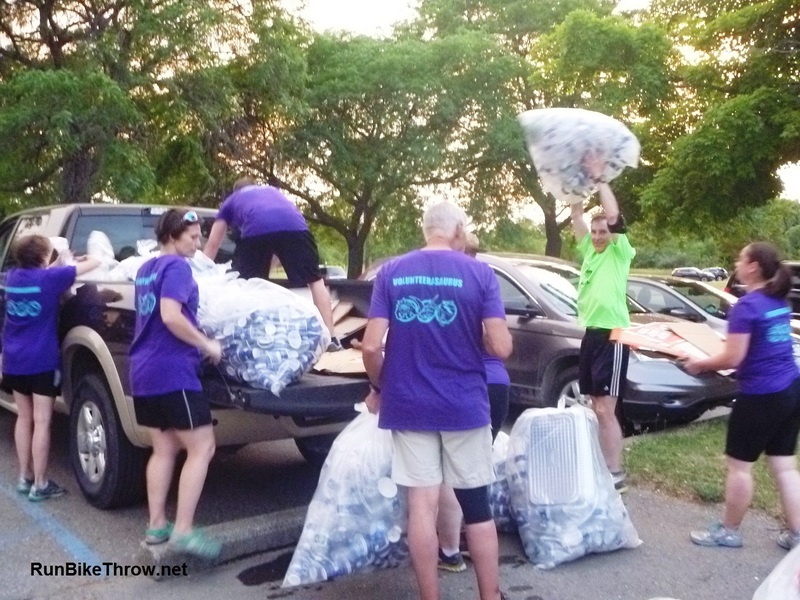 Good luck and keep running!